I love it… it so beautifull made. Oh it is just darling!!!! Just love it – so pretty!! Oh. It’s so pretty. Scratch that. It’s fantastic. Well done you!!! Hi, Angie! Your colorful blog – this is for me an island of joy and inspiration. And your new blanket – just no words! Very, very, very nice! 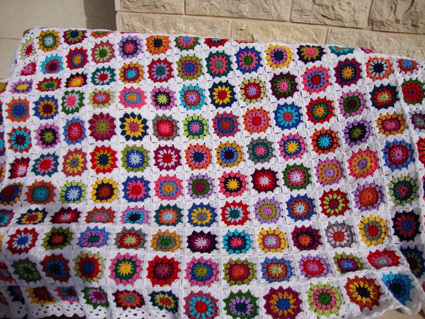 How many different shades of yarn you used for this blanket? Angie, sorry … I have found already … 24 colors … Thank you! Wow, I’m in love with this blanket! 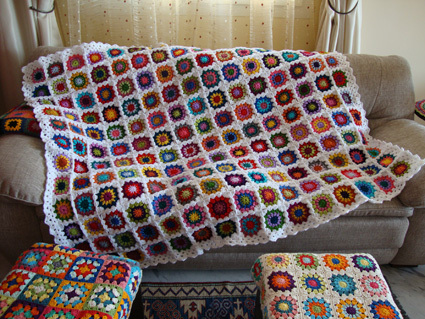 I would like to make one for me but the only blanket I made is still waiting for the borders! Sucrette: Just stunning…Your an inspiration! Absolutely my favorite–I truly love the white background best. It really showcases the happy colors you have chosen. Great job–once again! absoluutly awesome, and beautiful made !!!!!!!!!! the finishing edge is wonderfull. Elle est superbe ! Bravo…. aaaaaah!! What a beautiful fairy tale blanket. Yes!! I’m definitely in love. What a beautiful blanket. I love your patterns. I just started a blog with my mom. 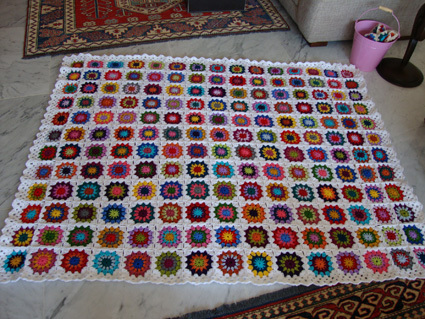 So far I just have a trial post about a blanket I am working on. So much to figure out about blogging. 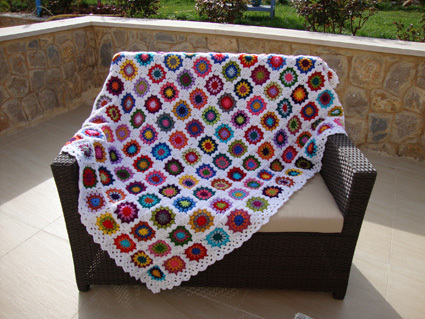 Beautiful blanket – love all your work! this is just so beautiful, it is giving me something to aspire to!!! Mind you I think I might be certified insane after making that many squares!! Quel travail et quel résultat ! Wow, you are a blanket machine! Super nice this new one, congrats! B E A U T I F U L!!! What a lovely blanket. Your finished blanket has inspired me to get back to mine. 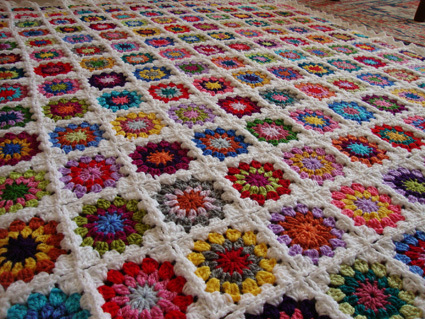 As soon as I finish my flower blanket I am going to get back to work on my white “granny garden” (the one similar to this one). Very nice. I can’t wait to see how your other two WIPs grow. Yes, I love your blanket! All these colours remember me the spring. Beautiful!!!! Oh wow! That is breath taking! Unbelieveable! I LOVE it! I love your blanket, it’s great!! Magnifique, splendide, une vraie oeuvre d’art. Je comprends que tu l’aimes. Encore une petite question : tu les as assemblés au fur et à mesure ? Beautiful!!!!! 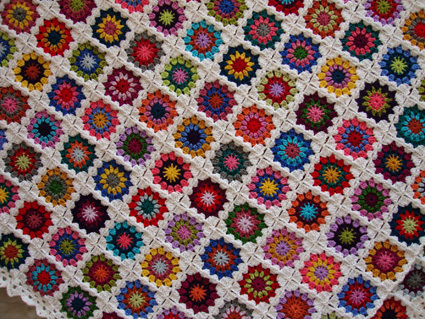 !You aren´t crazy because I love making grannys. 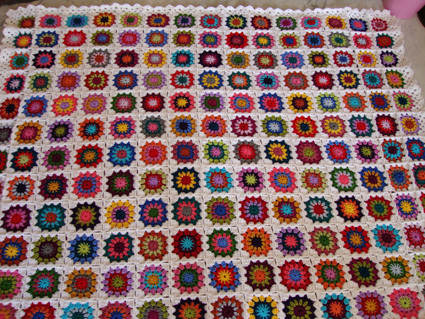 I begin one blanket similar yours.I´ll show you when I finishe it. Kisses!!!!!!! It is lovely! 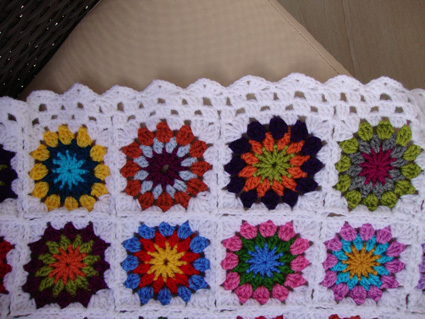 I am working on a granny blanket too (actually I am working on 2), but I think it is going to take me years to finish. Are all your granny in different colors? They are all different aren’n they? It’s a great blanket! So so beautiful – I love the edge as well. I’m finishing a little baby stripe blanket for a friend and thinking of using a similar edge that you used. Well done. Oh Wow! 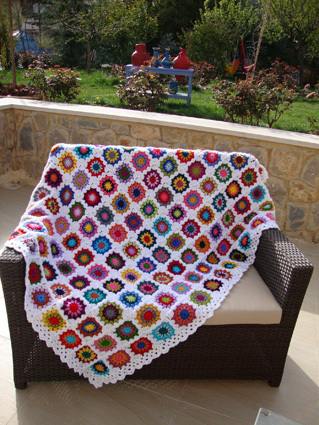 This is one stunning blanket! Je suis dans l’amour… Sigh 🙂 What a work of love it must have been. the blanket it stunning !!! 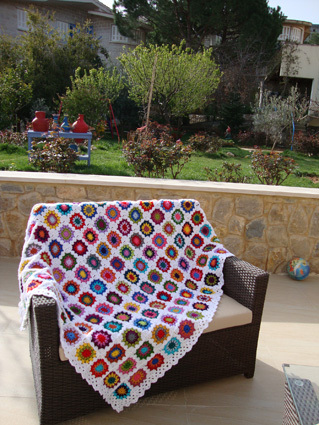 That is one of the most beautiful afghans I have ever seen! Just lovely! Your blog and your blanket is amazing. I can’t wait to see your next project. 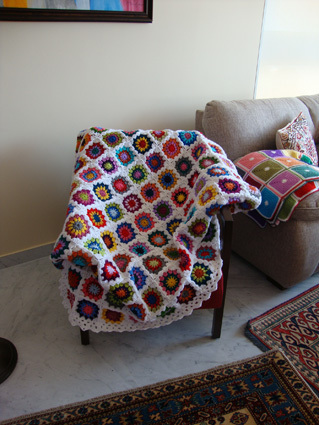 But I have to say that the blanket on the sofa is also wonderful (with the big squares). I like it so much that I would like to make one just like yours. So I have been looking on the internet all evening for a pattern, but I could’t find anything quite like it. Now (in despair) I hope you won’t mind me asking if you could help me with a pattern. I have recently found your blog and I love it! 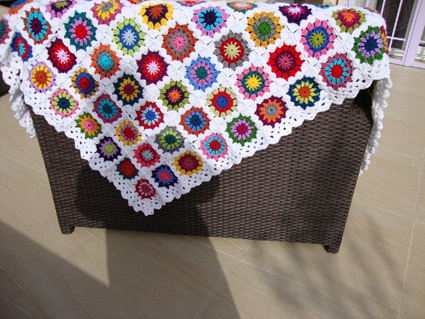 I love the pictures of your colourful home and your beautiful crochet. I’m amazed how quickly you make each project! I hope you don’t mind me asking but how many balls of wool did you use for the white? 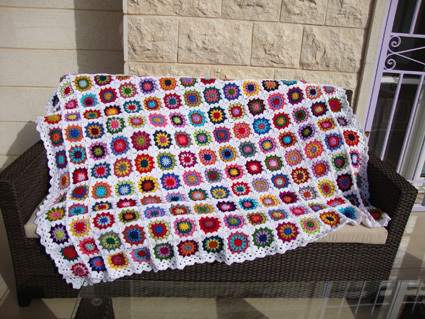 I am making a simlar blanket and need to buy the white yarn and I am wondering how much to buy?